Organic gardening by its very nature is much less expensive than gardening with the use of chemical fertilizers and pesticides etc. Many of the tips to follow involve the use of free or low cost organic methods. Growing vegetables and flowers from seeds can save money in the organic garden. Start with heirloom, or other non-hybrid seeds, so that you can save seeds of flowers and vegetables from one season to the next with the resulting offspring having the same genetics as the parent plants. Use free seed starting containers like cardboard egg cartons or make them from newspaper by wrapping paper around a jar, removing and folding the excess paper at the top inwards. Place the newspaper pots in a tray so they will support each other. The best thing is that you can plant the whole newspaper pots and they will decompose quickly. Commercial seed starting mix is expensive and not necessary. You can make your own mix by sifting compost through a fine screen. Rather than using expensive warming mats for starting heat loving seeds, place your trays on the top of a refrigerator or freezer until sprouts appear. Many plants can be started from cuttings, so it pays to learn about this technique as a free way to add new plants to your garden and landscape. Some municipalities have large scale composting operations for organic debris. Call your public waste department and ask if they offer free compost to home owners. They may even deliver, if you will take a large quantity. Compost bins are not necessary, and you can produce quality compost with a pile, but a bin can be a more attractive alternative. Call shipping warehouses in your area and ask if they have any damaged pallets that you can have. Use baling wire to wire three pallets together and use a forth pallet wired in an easily removable fashion for one side. Contact local stables, or your local zoo, and ask if they have manure that you could pick up. If the manure is fresh (hot), you will need to compost it before using it in the garden, add it to your compost pit along with other dry brown organic matter. Grass clippings are high in nitrogen and great for composting and use in the garden. A one inch coating of clippings can be worked into the top few inches of garden soil. Then mulch with a one inch layer. When adding grass clippings to your compost pile it is best to spread them out first to dry in the sun. This keeps them from clumping and smelling in the pile. Contact utility companies and tree maintenance companies and ask if they can drop off some chipped bark when they are in your area. They are generally happy to help because it saves them a trip to the dump. One caution is that there are some trees and bushes that have negative qualities for using as mulch. A couple of examples are Oleanders and Eucalyptus trees. Many tree maintenance companies have trained arborists on staff that may have knowledge of such plants that are grown in your area. You can also call your county extension office for advice. Let them know that you will be using the mulch in a garden and don’t want mulch from the undesirable trees. Newspaper has many uses in the garden. A few layers can be placed on the ground of beds and covered with a thin layer of mulch to help suppress weed growth. When shredded, it can be composted or used as bedding in worm bins. As mentioned above, it can be fashioned into useful seed starting containers. A few layers in the bottom of planting containers and hanging baskets can slow down drainage to allow soil more time to become moist when watering, and keep soil from washing out. Newspaper can even be used for preserving and ripening tomatoes. Near the end of the tomatoes’ normal growing season, pick tomatoes as soon as they are blush pink, and then wrap them individually in a sheet of newspaper. Place them in a box, and store it in a warm spot. The tomatoes will ripen slowly, providing fresh produce well into autumn. Anything that can hold soil can be used as a planting container. Use your imagination. Things like old tool boxes, wheelbarrows, wagons, even an old boot can be used. The appearance of containers can be changed with paint. Special paints are available for metal, wood and even plastic. Make sure to drill holes in containers for proper drainage. Some plants need to be grown in large containers. For containers that are deeper than the intended plants need, fill the bottom of the container with aluminum cans in order to use less potting soil. Quality is much more important than quantity when it comes to tools. Quality tools can be found second hand and will last for a long time. 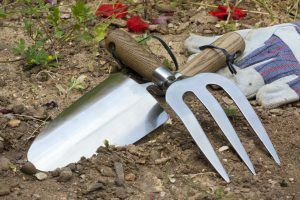 Consider what tools are really necessary in the garden. You can generally get by just fine with only a handful of useful tools. For sturdy custom stakes for climbing vines any pole can be used. Consider recycling items like curtain rods, hangers, or even things like sunflower stalks from last season’s garden. Old hangers can be bent and connected together into many shapes to fashion tomato cages, trellises, stakes and bean poles. Cut strips of old clothing to use as plant ties. Hard plastic kiddy pools come in several sizes, are inexpensive, and have some great garden uses. For transporting and moving mulch, manure and other garden debris, drill two holes near the top on one side and connect a strong rope. The bottom of the pool slides well and this makes for a great pull container for moving things in the garden. 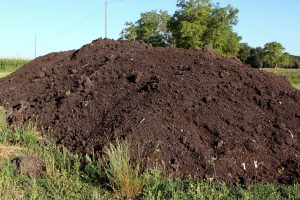 It can easily be dumped over on a compost pile or other area for unloading. These pools also make great potato planters. Drill several drainage holes in the bottom and place potato starts on the bottom of the pool. Cover with a layer of compost, and as plants grow, continue to add layers of mulch until it reaches the top of the pool. This can be a great way to meet people, get free information and find out about great gardening deals. Saving water is not just a way to save money; it is also a responsible use of our natural resources. Consider drought-resistant plants for part of your garden and landscape. Install an inexpensive drip irrigation system. You will use less water and keep your garden consistently watered with less leaching of soil nutrients. If you live in a rainy climate, install rain barrels under drain spouts to harvest great water for your garden. My grandmother used to even use a large bucket in her sink to wash dishes. Then she would let the soapy water cool and poor it over plants prone to pests in her garden. Perennials are the gift that keeps on giving. There are even some great edible perennial varieties. Each season perennials can be divided to make more plants; these also make good gifts to give to gardening friends, or to trade for other plants. Many flowers are multi-purpose plants being both beautiful and edible giving you more bang for your buck. Examples include bachelor’s buttons, violas, calendula, pansies, and roses. Other plants and flowers can do double duty by attracting beneficial insects or attractive winged beauties. Yarrow, alyssum, fennel, cumin, and coriander are plants with this characteristic. 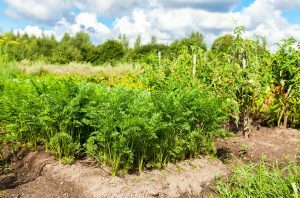 It is easy to get carried away when planting your vegetable garden and end up with too many of some vegetables and some that your family does not prefer to eat. Consider how much of a particular vegetable or fruit you need for your family’s consumption as well as a little extra to share or trade with family and friends. Consider succession planting and storage methods to extend the usefulness of your harvest. Do not plant vegetables in your garden that are available in season at your local market, high quality and inexpensive. With proper seed storage, seeds can be saved for several seasons. Rather than planting more than you need or planting things close and then thinning, plant just what you need with proper spacing to begin with. Empty spaces where seeds did not germinate can be filled with helpful companion plants. Best results can be had from concentrating on easy to grow and/or heavy producers. In the vegetable garden, climbing peas, tomatoes, beans and squash tend to provide more produce than their bush equivalents. If you are limited in space, growing these plants vertically can be very successful. In addition, plants like zucchini are notorious for their yields. Trade with neighbors for food you didn’t grow. Make sure to get varieties that are suited to your climate. Consider including the following easy to grow vegetables in your garden: radishes, squash, carrots, lettuces and other greens, peas, onions, garlic and tomatoes. Assorted herbs make great companion plants for vegetables, are easy to grow and are useful in the kitchen. Learn how and what can be canned or frozen from your garden. This can lessen garden waste and help you extend the usefulness of your harvest. By applying these tips you can have a beautiful and productive organic garden without breaking the bank.